Dynaco was an audio system company founded in 1955. 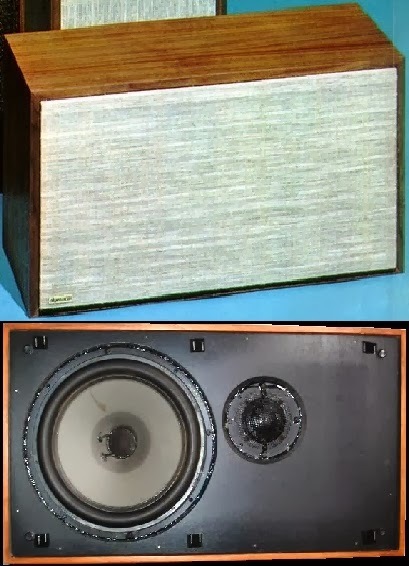 They were especially popular from 1960-1970 for their high quality and simultaneously affordable audio components. The company is well known for a few very well made stereo amplifiers and speakers during that time. One of these is the Dynaco A-35 loudspeaker. The A-35 was a refined improvement over its predecessor, the A-25. In fact, the Dynaco A-35's have the same woofer and tweeter as the A-25, but in a bigger enclosure. With a smooth, wide range and a crisp sound, it had a much better and more defined low end. Many stereo enthusiasts consider this to be Dynaco's best speaker. The A-35 was housed in a more complex cabinet with a different crossover. This made for a much more articulate sound. It has more bass than the A-25 and dynamic capability. A high performance, two way system, the speakers have a non-rigid hemispheric tweeter with wide dispersion, which is crossed over at 1200 Hz to an extended excursion 10" woofer. The 10" woofer has a rubber surround, which is more durable than the usual foam surrounds found in most vintage speakers. The cabinet has two sealed chambers, partitioned in between by a damped vent. At lower frequencies, the enclosure gets larger for a more neutral sound. The speaker can be used with amplifiers having continuous power ratings up to 60 watts rms per channel, and the minimum suggested power is 20 watts. On the back of the speaker there is a selector that increases and decreases the high and mid range tones. I found a pair of these (as well as a pair of A-25s) tossed on the sidewalk in the rain one night, screens stained and scattered about. I expected the woofers to be kicked in but they appeared to be in perfect shape—rubber surrounds pristine; I wasn't familiar with them, but I do know that vintage-looking speakers with "Made in Denmark" on the back were worth relocating somewhere out of the rain to check out later (badges were missing). The cabinets did have severe water damage, mostly aesthetic, though some corner joints have swelled apart, so I figured they were probably toast inside as well (someone threw them out, after all), but thought I'd see. Weeks later I finally got around to cleaning them off and hooking all four up to my Sansui 7070. I cued up "Stuck Inside of Mobile with the Memphis Blues Again" and held my breath as I put the needle down, half expecting something to blow up. The sound... nothing short of incredible! Crisp highs, perfectly balanced mids... I love these ugly, moldy smelly things! Never getting rid of them. As a reference, my other system in the same room (which I sometime A/B with it) is a Bryston 4B /Adcom GFP-565 powering Paradigm Studio 100 v.1s. The fact that the Dynacos compare favorably (at moderate volume) is pretty amazing. A lady just gave me an old stereo that she wanted to get rid of. Just gave it to me for free. The system included a Mutant model 1050,a Dual 1214 Noresco turn table and a pair of Dynaco A-35's. The turntable needs work but the Marantz and speakers sound amazing!! !